Heat olive oil over low heat in a large saute pan, and add shallots, stirring until soft, about 2 minutes. Raise heat to medium and add beet greens, salt, and pepper. Toss with tongs until wilted but still bright green, about 1-2 minutes, then transfer to a collander, pressing down to squeeze out liquid. Divide the greens mixture into 4 equal parts. Combine lemon zest with the herb mixture and pumpkin seeds and set aside. Lay filets flat on a work surface, with the prettiest side facing downwards. At the narrow end, of each filet, add the reserved greens and roll fish into a cylinder, with the greens inside. 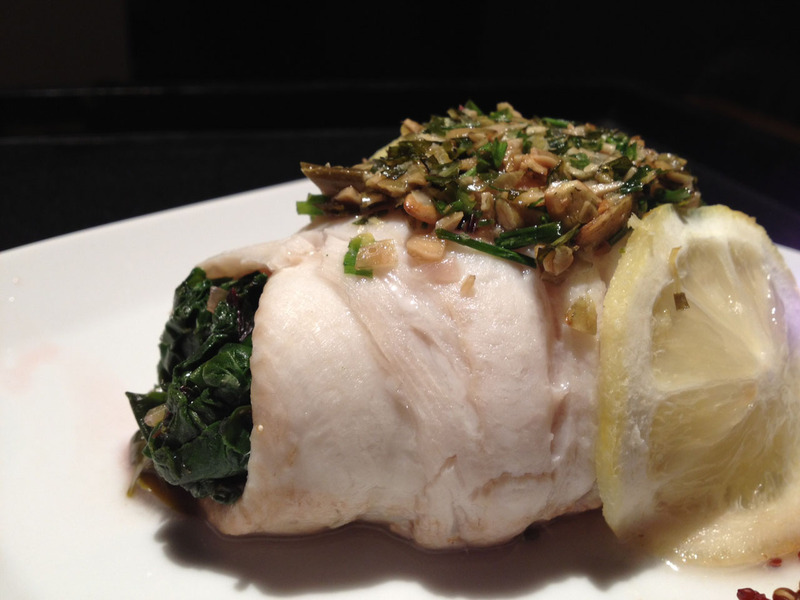 Place the fish into a baking dish, each filet roll separated by the lemon rounds. Divide the zest/herb/pumpkin seed mixture on top of each roll. Pour wine into the dish. Cover with parchment paper then aluminum foil, and bake until fish is opaque and cooked through, about 15-20 minutes. Serve with the quinoa. Quinoa: combine the reserved beet green stems with the red quinoa, and cook in 2 cups salted water, as directed. Inspired from a recipe on Martha Stewart Living.